Welcome to your safari! Upon arrival into Victoria Falls Airport, you are met and transferred by road to Victoria Falls River Lodge, where you will stay for two nights. The lodge is the first private game lodge to be set in the Zambezi National Park. It is situated on the banks of the mighty Zambezi River, just minutes from the Victoria Falls. Spacious tents, standard, twin and family suites, are set right on the banks of the river.Each en suite tent has been decorated in earthy hues and has a freestanding bath, sitting area, indoor and outdoor shower and a private viewing deck, where you spot the exceptional wildlife. The main lodge has an open plan design where guests can sit back and relax, under the shade of the thatched roof, as elephants graze along the river line. The Victoria Falls River Lodge takes relaxation one step further offering a selection of in-room massages, pedicures and manicures. The lodge also has a swimming pool and gift shop. Some of Africa's most amazing animals are right on your doorstep. 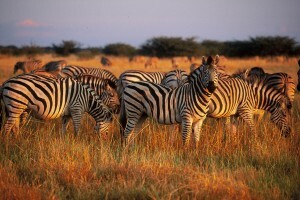 Elephant, hippo, buffalo, giraffe, zebra, wildebeest, impala and even the occasional big cat can be viewed in the park. The lodge offers two safari options; the first is to take a river cruise along the Zambezi or head out in a land cruiser - day or night - to explore the 150,000 acres that make up the Zambezi National Park. For bird watchers, 415 bird species have been recorded in the park – it's a birders haven Victoria Falls town lies on the southern bank of the Zambezi River at the eastern end of the famous falls. It is a tourist town that is easy to explore on foot. Activities run from the challenge of white water rafting and Bungi jumping, to elephant back safaris and sunset cruises. Following the morning activity (time permitting) and breakfast, guests will be transferred from Victoria Falls River Lodge to Kasane Airport by road for a seat in charter transfer to Selinda Camp, your home for two nights. Selinda camp is an intimate camp offering understated luxury on the banks of the eastern Selinda Spillway - a waterway that links Botswana's Okavango Delta to the Linyanti and Kwando marshes, rivers and floodplains. The shaded camp is raised a meter or so off the ground and offers extraordinary views over the floodplains, waterways and wide-open savannas which are only broken by attractive palm islands. It is these views that are one of Selinda's most compelling features. The recently refurbished camp has nine spacious guest tents under thatch, each with two comfortable three-quarter sized beds draped with flowing mosquito nets adding to the romantic atmosphere. The thatch roof combined with ceiling fans and roof vents cool the living space during the hot days. The rooms have spacious, en suite bathrooms, with full sized stone baths and antique showers. Dual vanity basins complement the sense of luxury and sliding doors allow for privacy or create an open-air bathroom feel as well. Following the morning activity (time permitting) and breakfast, you will be transferred by light aircraft to Baines’ Camp for the next two nights. Baines’ Camp, named after the famed nineteenth century explorer and artist Thomas Baines, is the banks of the Boro River, in a 260,000-acre private concession in the Okavango Delta that neighbors the Moremi Game Reserve. Set among the shady trees and water of the delta, the small and intimate camp features just five luxurious suites set on elevated platforms in the tree line. The elevated suites on wooden decks offer expansive views over the lagoon teeming with life. At this camp, you have the opportunity to sleep under the stars on your fully mobile four-poster bed. The main area features an oversized deck for outdoor dining and offers views over the beautiful lagoon. Relax at the swimming pool with two thatched salas on either side. The area is superb for viewing all animals and bird species. Explore by land in open-sided 4 X 4 vehicles, often into the night to discover nocturnal species. You can also enjoy water safaris at the gentle pace of a poled mokoro or by safari motorboats (offered most of the year, subject to water levels). For a different perspective, you can go on walking safaris on foot with skilled, armed professional guides. The choice of activities does not stop there. You can also experience the unique and educational elephant interaction, which is an optional activity at an extra surcharge. Pre-booking is recommended for this activity. The Okavango Delta is one of the world's largest inland deltas situated in the middle of the largest stretch of continuous sand in the world - the Kalahari basin. This oasis in the middle of the desert is a rich yet fragile ecosystem, providing a life source for an incredible variety of wildlife. A wealth of species have adapted to the contrasting conditions created by living in the harsh Kalahari desert which is transformed annually with the arrival of the delta flood waters originating in Angola. The Okavango wetland encompasses Moremi Game Reserve, with its private concessions. These concessions are wildlife management areas, carefully administrated to balance the growing community’s development and conservation, while empowering citizens through sustainable tourism. 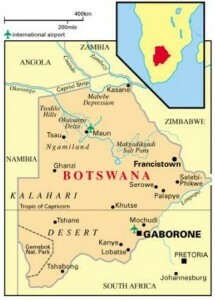 Many of the exclusive lodges in Botswana are situated within these concessions in the delta, providing an unparalleled wildlife experience - exclusive and remote, avoiding mass tourism and exploitation. Flood levels fluctuate dramatically throughout the year, with high water levels peaking in the central Okavango during the dry winter months and water levels at their lowest during the later summer months, contrary to the seasonal rainfall.